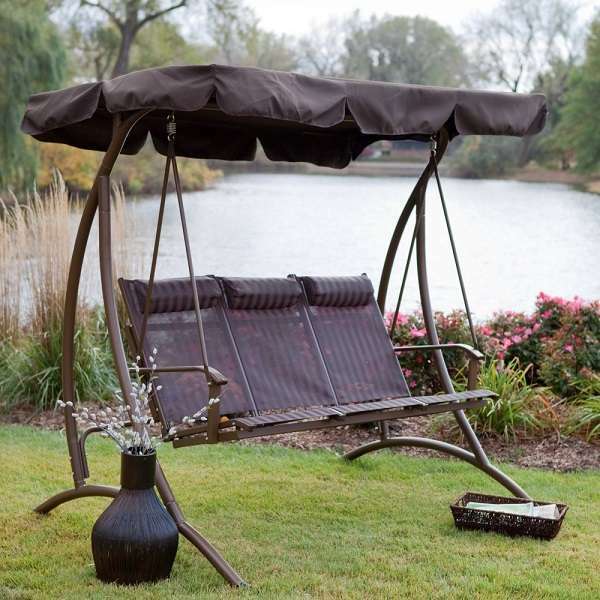 There is nothing comparable when you can have a nice spot to relax outdoor in your backyard. 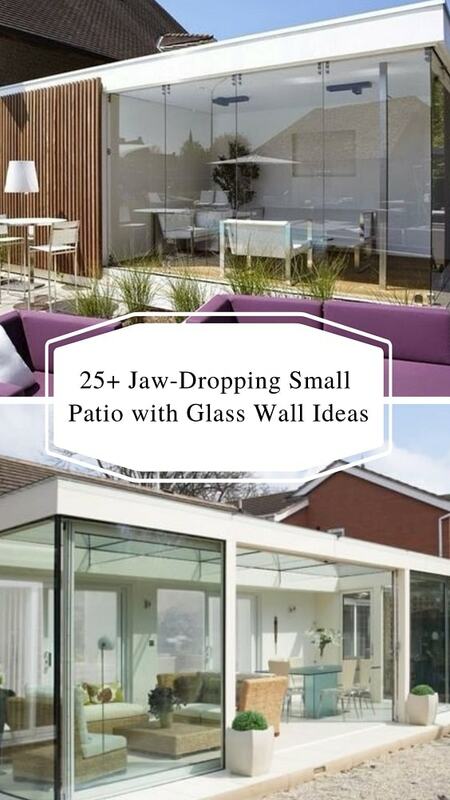 So that is why patio – as the ideal realization of this imagination – becomes more and more popular among many homeowners. 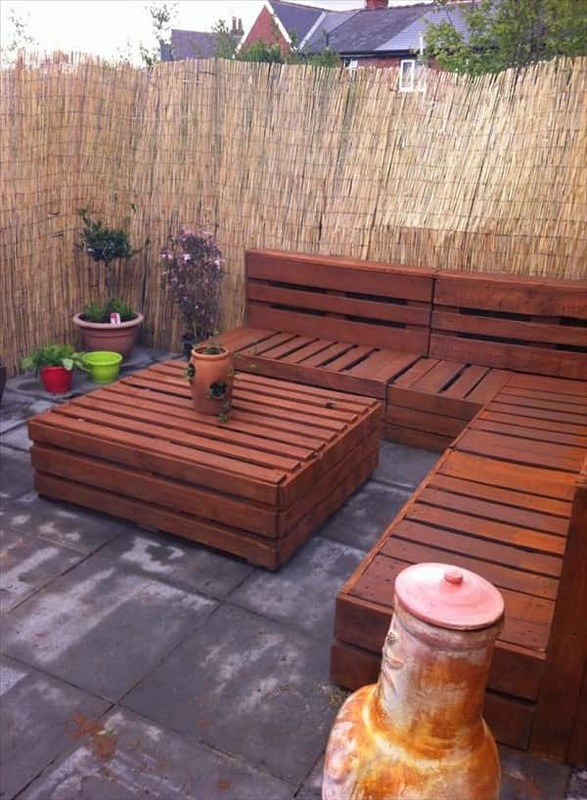 The patio is just something that you can’t miss for your outdoor space improvement plan. You can’t let your backyard just look that ‘green’ with the field of grass around. Then, adding the paved accent to enhance the look and function is never a bad idea. 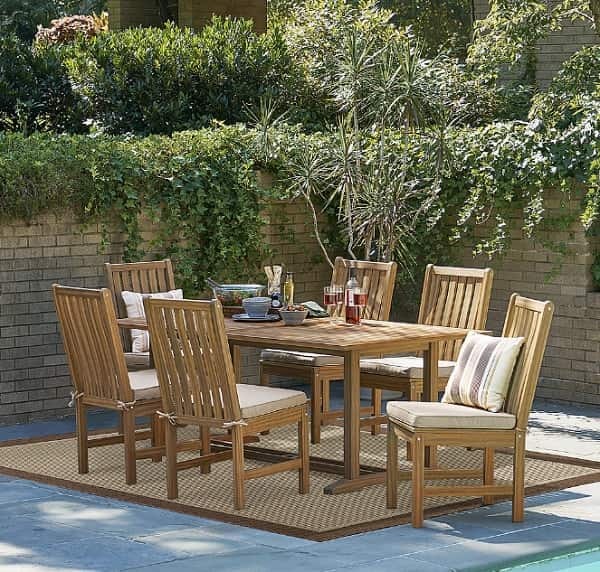 The next thing to complete the patio is obviously the furniture, you can’t really use your patio without any chairs or tables around. Then, what’s next? 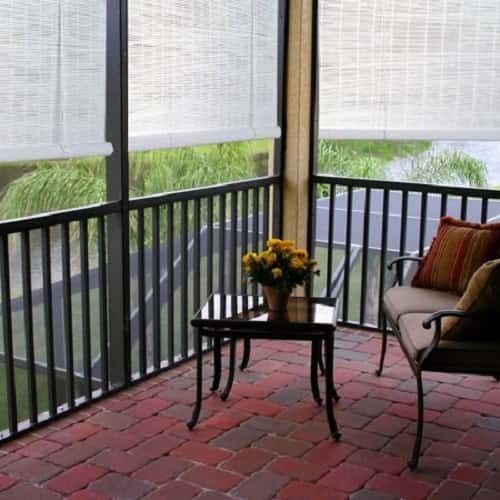 What’s the next ‘obligatory’ stuff that you should put on your patio? The ASLA (American Society of Landscape Architect) stated that today, the fire pit is the first must-installed feature to decorate your indoor or outdoor space. It is because fire pit offers many advantages once you have it on your property. Better relaxing time, providing more practical functions, enhancing the look and the value of your property are some main advantages that you will get from a fire pit. 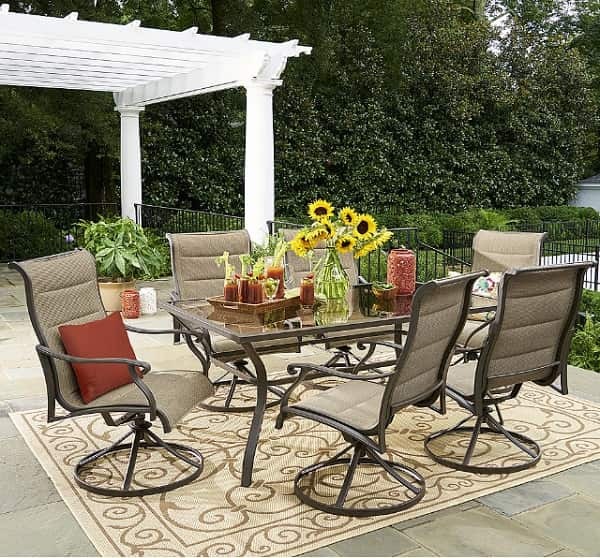 Whether you prefer to go with the simple one like those made of the metal bowl or the more complicated fire pit, it surely depends on your taste and the style of your patio. As the fire pit is such an easy outdoor space feature to build, you can always make one on your own. It’s always a fun activity to do some DIY projects to decorate your property. 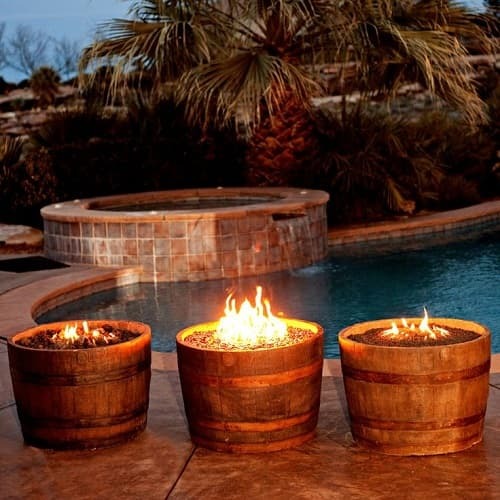 Therefore, here we have some stunning inspiration of DIY fire pit ideas that you can copy for your patio! 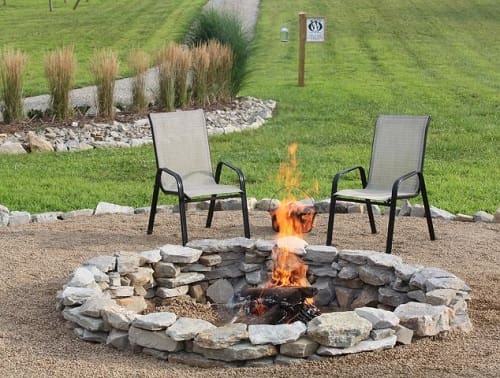 An easy-to-build fire pit that surely inspiring to have. This is such a good idea for you who prefer to go with the square-shaped pit than the round one. There is no any painting needed here, in which the natural stone finish is kept to give a gorgeous earthy rustic look around the outdoor space. 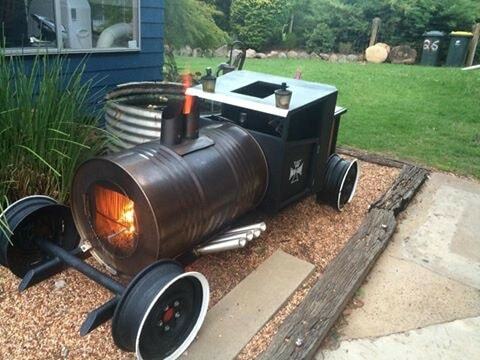 To build this one, you will need some paving stones, rapid set mortar mix, concrete trowel, and furnace stove cement. 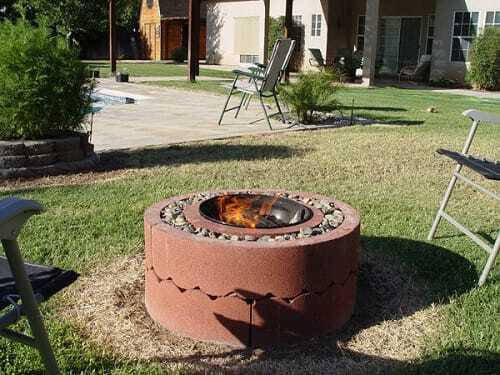 This creative DIY fire pit ideas is made of the used washing machine drum and steel. You can try to make one if you already have a broken washing machine. But you can also purchase one from a used appliance store. This project only costs not more than $20, but you’ll need to be more careful as you will deal with those steel things. 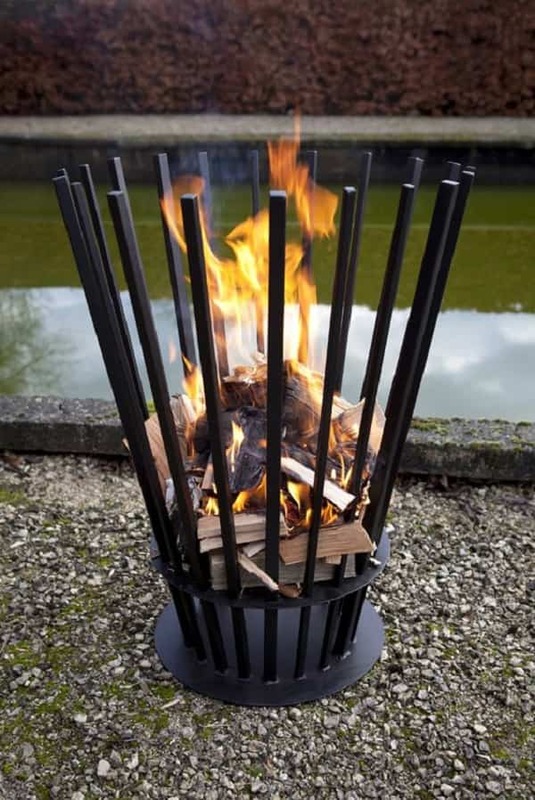 One of the simplest ways to make an outdoor fire pit is by using the galvanized fire ring. You can just place it on the gravel or stone surface. Decorate it with some rocks around is always an easy way to make it look more attractive. 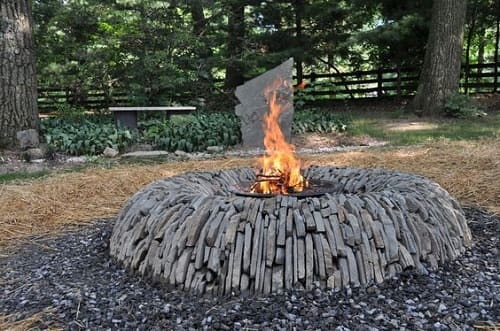 Using 4 sections of concrete tree rings (circular concrete which is used to protect the bed of tree), charcoal grill, and some pebbles you can build this beautiful fire pit on your own. 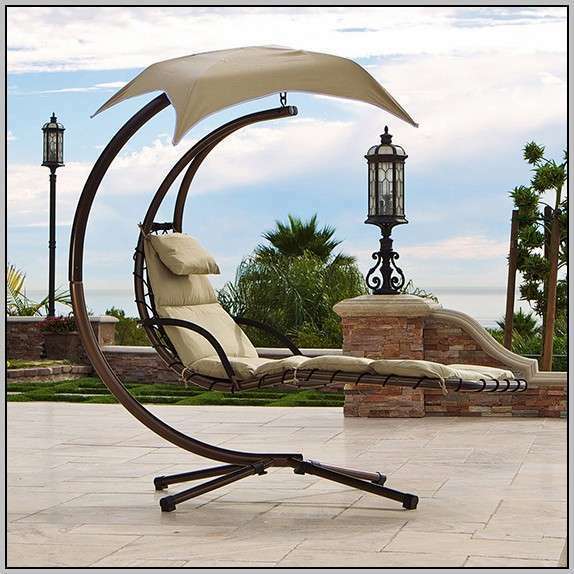 The design is so stunning and will add such a distinctive touch to your patio. You only need to spend $50 to $80 and, obviously, some efforts to have this in your outdoor space. 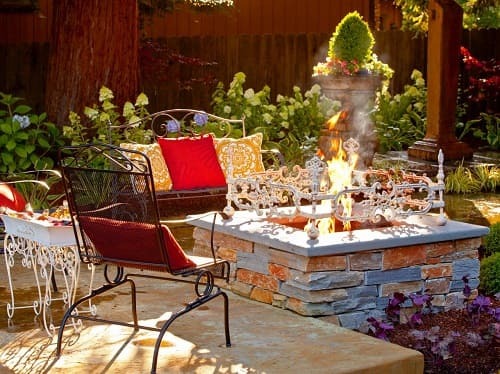 The stunning fire pit with a very glamorous traditional style that reminds us of those Victorian pieces of furniture. The use of flat light gray and yellowish stones as the pit construction is smart enough to make it look beautifully rustic. 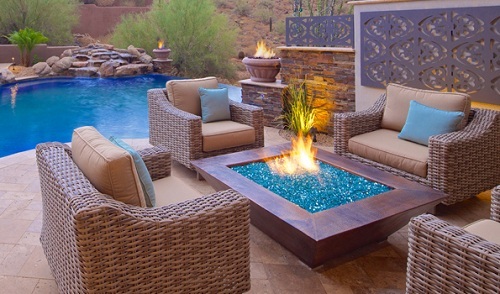 That decorative steel frame is the unique touch here, which enhances the overall look of this outdoor space’s fire pit. If you think that stones or concrete don’t work for you, then go with the steel. 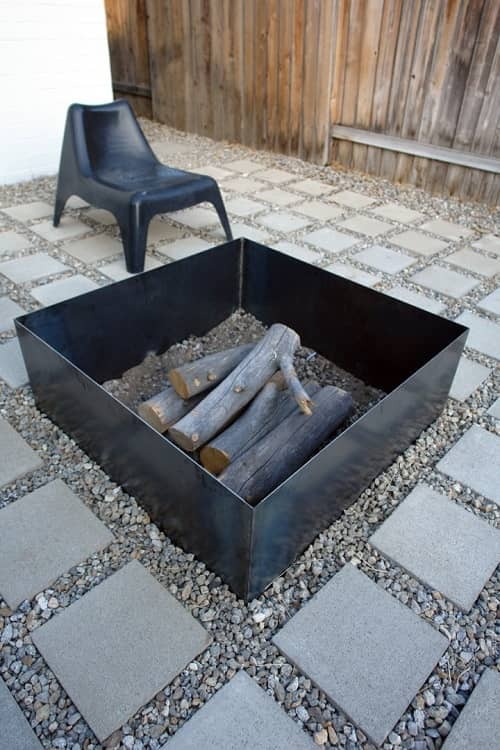 This awesome DIY fire pit ideas is made of 4 black steel sheets with the rounded steel as its base. The idea comes when the steel fire pit is considered more durable than the concrete one. It’s quite handy to build and doesn’t cost a lot. 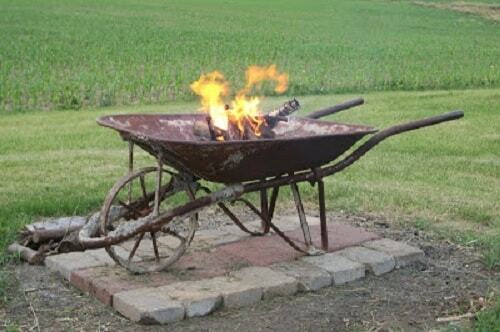 The simply creative patio fire pit made of the used wheelbarrow. There is no refinishing here in which the rust is left there and it looks so irresistible. You can think to build this one if you have an unused wheelbarrow around. 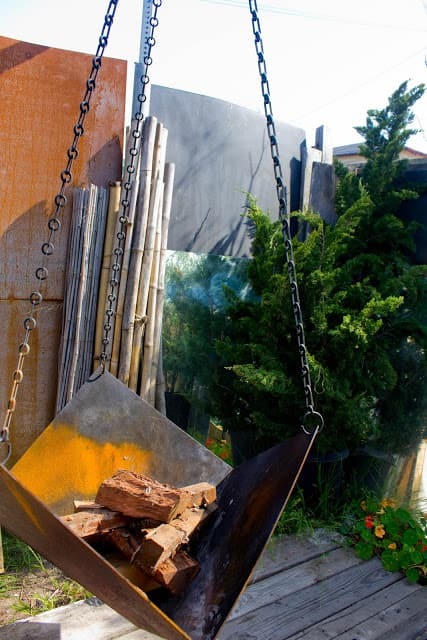 This is surely suitable for you who wants to add a distinctive industrial look to your outdoor space. 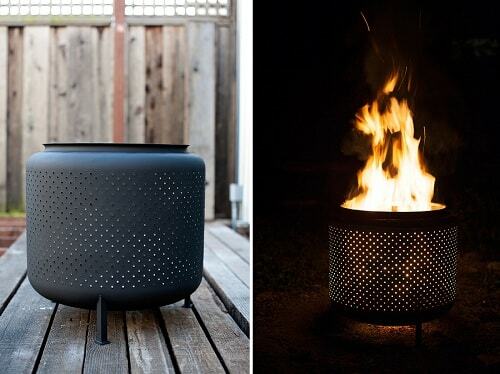 This fire pit is kind of the portable one which looks so adorable. 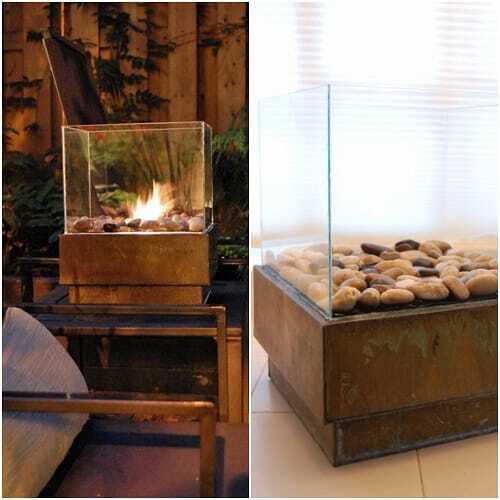 Go hunt for some glass frames, metal planter, metal mesh, pebbles, gel fuel, and marine silicone to copy this idea. You can place this fire pit on the metal table or on to of the rock level. The costs that you should spend to have this one is not more than $25. 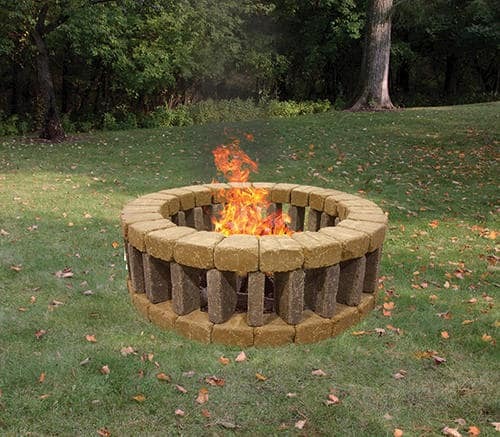 The extremely easy to make fire pit that you can try to decorate your outdoor living space. You just need to dig and stack to make this one. 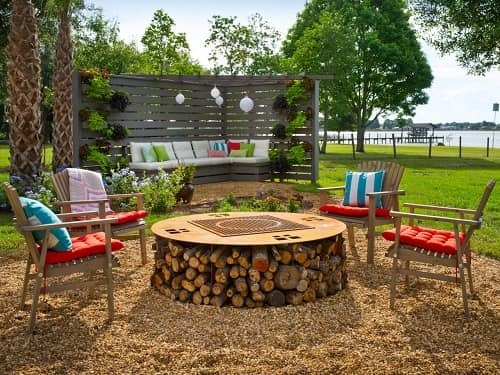 It can be a nice DIY fire pit ideas if you are going to build a circular patio with the built-in fire pit. 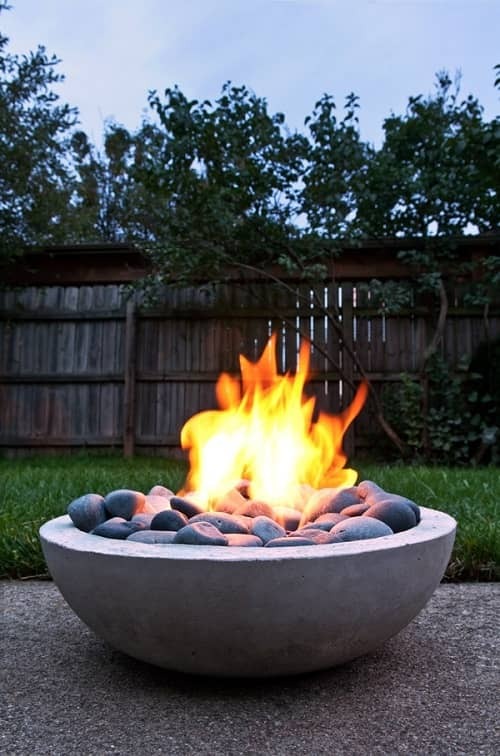 Another cute fire pit for outdoor space which is made of concrete, bowl, and pebbles. The design is contemporarily wonderful flows gorgeously with the backyard’s surrounding. 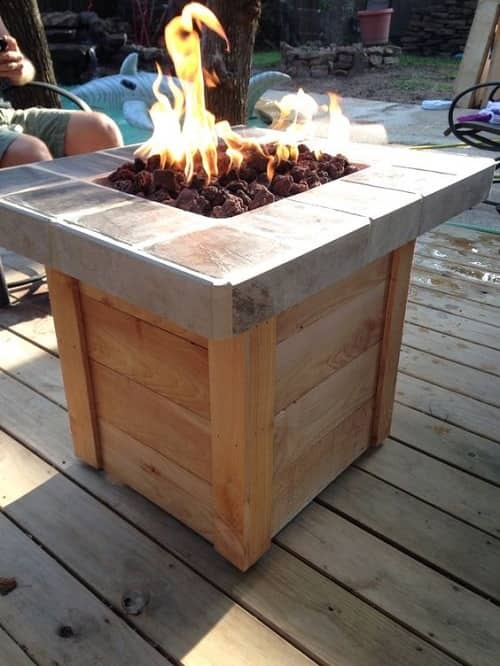 It will cost you not more than about $120 to create this fire pit by some molding steps to do! The unique and attractive fire pit made of some small logs as its base construction. The look is very natural that matches well with the outdoor space environment. 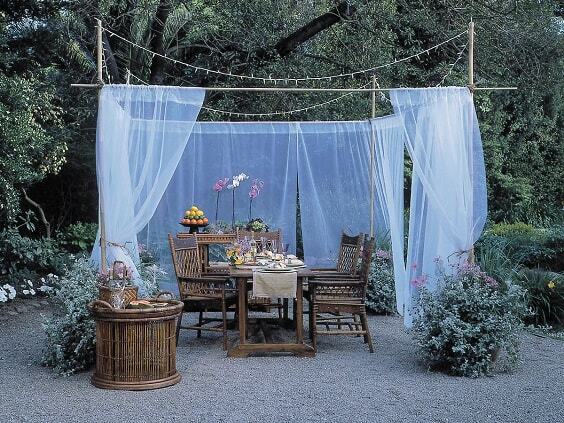 By adding this, you already make such a distinctive touch for your outdoor living space. 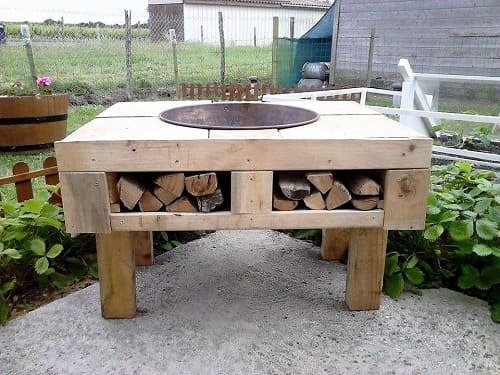 Another easily constructed fire pit where you just need to stack and go. 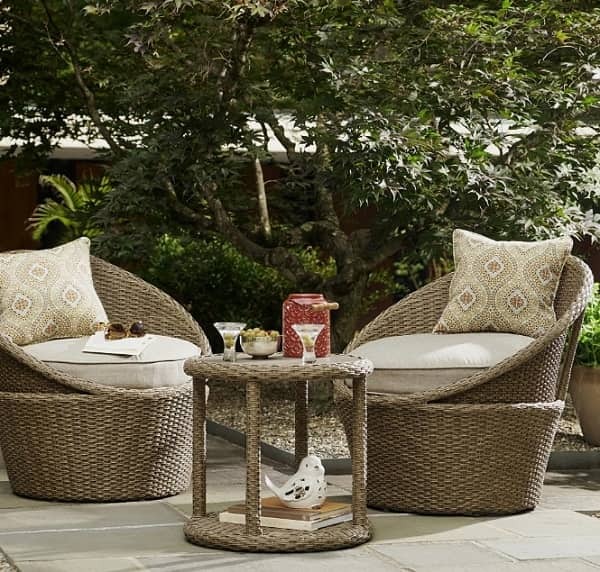 The look is so traditional yet nice enough to add more decor to your patio. The main materials of this DIY fire pit ideas are only the Belgian Blocks and heavy-duty adhesive. You can use concrete for a better long time use. 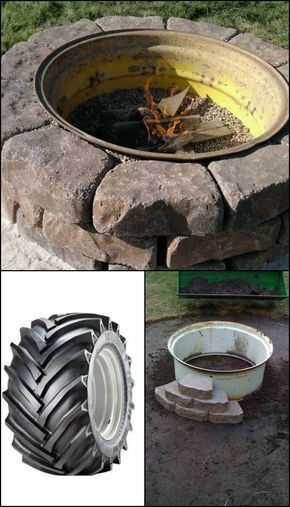 By using an upcycled truck wheel and some stones, you can copy this industrial style fire pit to place on your own patio. It doesn’t need lots of cost and efforts to make this one. You can go purchase the unused wheel and some flat rocks to stack! The simple earthy fire pit table which looks so lovely to decorate your patio. This is not really hard to build and will match well with those wooden style furniture. Again, this one is for you who love to add something industrial to your outdoor space’s decor. The bold-looking fore pit which made of the combination of galvanized steel bucket placed inside the wood frame with black stones around. 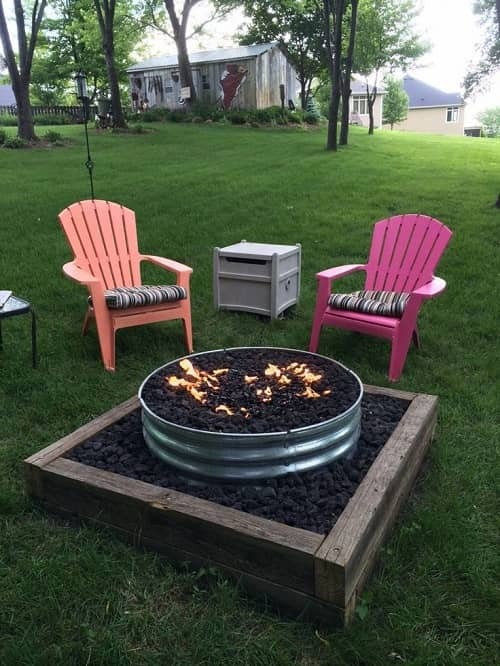 A gorgeous portable fire pit with wood base and the concrete top. The combination creates such a simple look which is enough to add an adorable decor to your patio or deck. Looking for something more effortless? 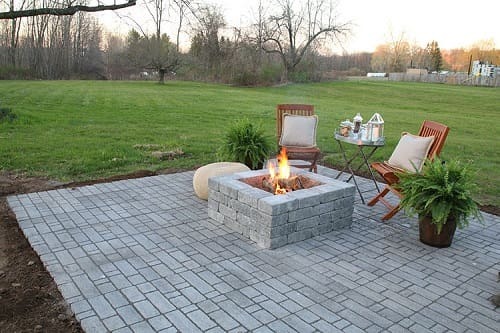 This cinder block fire pit can be one of your best options. 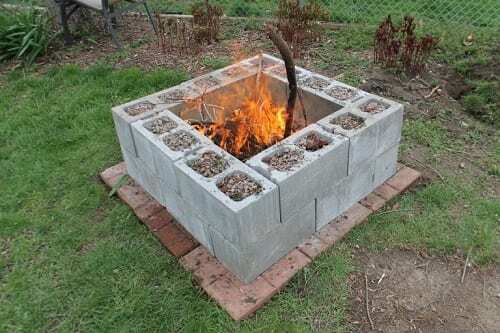 You’ll just need to purchase some cinder blocks, stack them together, then you have your own cinder block fire pit! 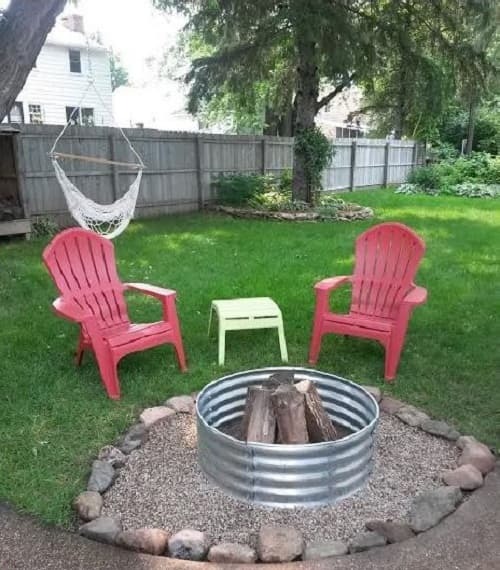 Another DIY fire pit ideas which involves much less of efforts. It is actually made of some random flat stones which are stacked together and form a ring. This super rustic natural look is surely attractive and will add such a creative sense to your outdoor space in an instant. The outstanding fire pit in hanging style to add a more masculine look to your patio. You can see the geometrical shape of the metal pit is quite distinctive. Its rustic corrode finish surely enhances the attractiveness of this DIY fire pit ideas. The last one is the fire pit which made of the wine barrel. Placing this fire pit on your patio will create such a Western Country touch that will make your patio look and feel more inviting. If you are willing to go one step further, this fascinating old roadster fire pit should one of your considerations. Made of some used stuff, the designer makes the design of the fire pit looks so attractive. It surely reminds you to those roadsters which come from 60s. 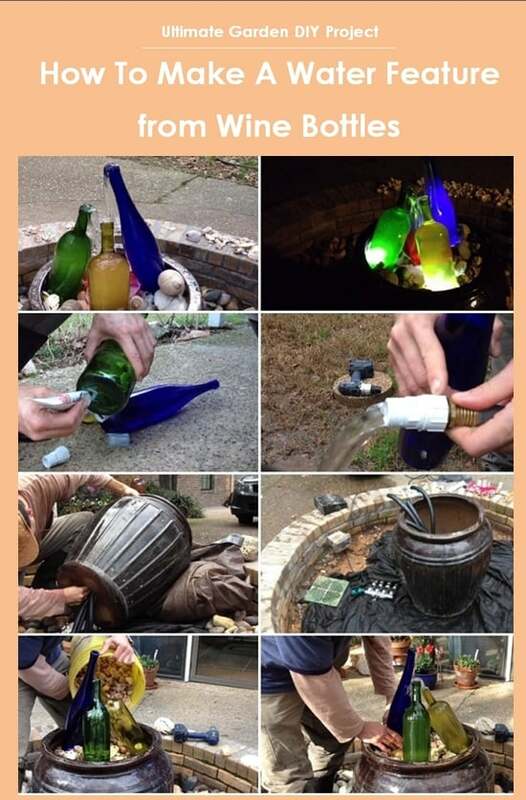 Those are some adorable DIY fire ideas for the patio that you can try. Don’t ever forget to always make some safety gear when like gloves and google when you execute the project. You also have to mind about the durability of the fire pit since it will directly face the fire. It’s not only about the look but also about how your work can last for years to warm your patio.